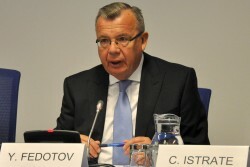 Yuri Fedotov currently serves as the Executive Director of the United Nations Office on Drugs and Crime (UNODC) at the rank of Under-Secretary-General. He was appointed to this position by the UN Secretary-General Ban Ki-moon on 9 July 2010. He is also Director-General of the UN Office at Vienna UNOV.